Dauntless, the coop RPG game is under development but the fans would like to know more. For example, how the fights are going, and the developer Phoenix Labs has released a new video. In this, a hero fights with an ax and later with a sword against a so-called Behemoth who is the main bosses of the game. Good to see is that the ax is much more comfortable than the sword. It takes longer for the warrior to take out the ax while he is able to carry out rapid attacks with the sword. Also good to see is that the battles are very action-oriented and active. The hero must constantly move, evade, and exploit weak points of the opponent, for example if he is struck by the force of a blow. This shows how Dark Souls plays in the RPG. You must study the movements and patterns of your enemies in order to defeat them with targeted attacks. It is also important that you avoid the special attacks of the enemy, as these will cause a lot of damage. The fight against the Behemoth takes quite a long time, although it is not to say whether it is only because of the video takes so long to show the fight or whether the battles cannot be done quickly in the game. It is important to remember that Dauntless is still at a very early stage of development. 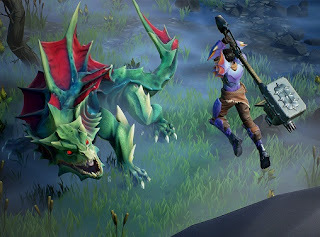 Therefore, the show does not represent the final form, but is only intended to demonstrate how the fights are about to run, how the handling of the guns feels, how the hit reaction of the enemies is ... Dauntless will start in a beta in the coming year and now you can register on the official website.